The mastery of classic Persian design and color that we see here is unusual even among the finest Kermans of this kind. Large Gallery Size Long and Narrow Antique Persian Kerman, Country of Origin / Rug Type: Persian Rugs, Circa Date: Late 19th Century - A vine-scroll trellis or Mina Khani design of lush, leafy arabesques repeats with consummate grace and symmetry across the raspberry field of this extraordinary antique Kerman rug. 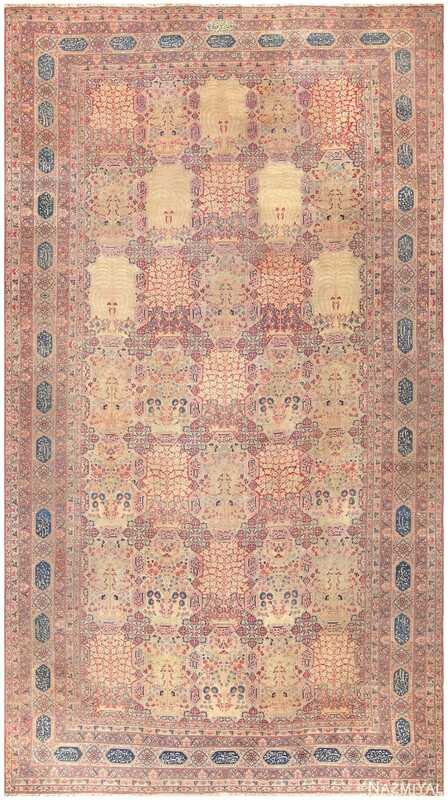 The color of this beautiful antique Oriental rug combinations of ivory, soft ochre, and forest green against the raspberry ground are simply superb. The border has a lavish strap-work arabesque vine-scroll set against a creamy ivory ground that offers the perfect framing contrast to the palette of the field. Such a mastery of classic Persian design and color is unusual even among the finest antique Persian Kerman rugs of this kind.